Oswego NY, October 10, 2017 - River enthusiasts who stay year-round are hardy souls well-prepared for cooler temperatures and seasonal weather. 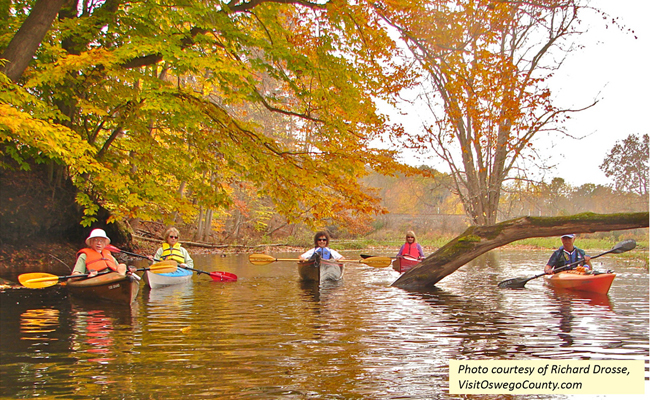 For those who enjoy kayaking, canoeing or using a row boat late in the year, New York Sea Grant Extension of Cornell University offers a reminder about New York State legal requirements and eight tips to enhance seasonal water safety. Water that is less than 70 degrees Fahrenheit can lower body temperature and lead to life-threatening hypothermia. According to the U.S. Coast Guard, a body can cool 25 times faster in cold water than in air, children cool faster than adults; and smaller people cool faster than larger individuals. 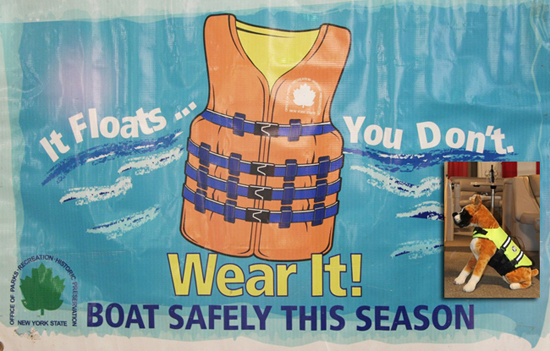 “New York Sea Grant issues an annual reminder about life vests that are required to be worn by State law starting November 1 but are a good idea whenever the weather turns cooler. 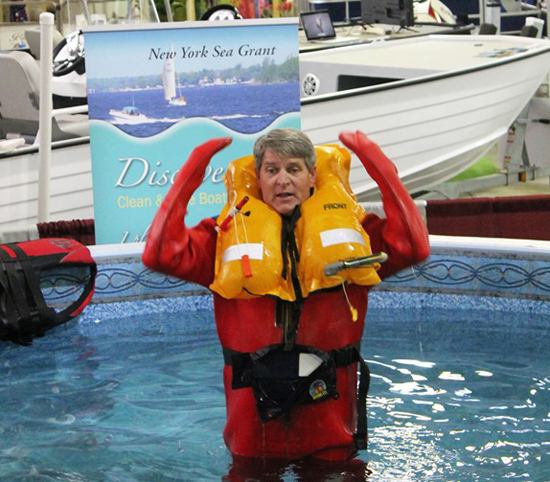 These safety tips are meant to help make anyone who gets in trouble on the water more buoyant and more visible to extend the opportunity for rescue and survival,” said New York Sea Grant Coastal Recreation and Tourism Specialist Dave White. New York State law requires that everyone in a recreational vessel of 21 feet or less must wear a US Coast Guard-approved personal flotation device, or PFD, from November 1 to May 1. A PFD should be in good condition and appropriately sized for snug fit, particularly check that for children their head will not slip through; bright color and attached whistle are recommended. And don't forget that all passengers means ALL. Learn the types of approved PFDs to make the best choice for safety and activity. A variety of US Coast Guard-approved floatation devices, beyond the commonly thought of life vest, are available to provide buoyancy. For example, a floatation coat covers the torso. A float suit encloses most of the body to provide buoyancy. One-piece immersion suits cover head, body, feet and hands, leaving only the face exposed. Communicate your activity plan, or float plan, to a responsible individual on shore. When you are leaving, where you entering and exiting the water, where you are going on the water, and when you expect to return. Contact that individual upon your return so they know you have safely returned. Use reflective Safe ‘n Sight paddle decals to increase your visibility on the water. An "If Found: Contact" sticker may be attached to your vessel. 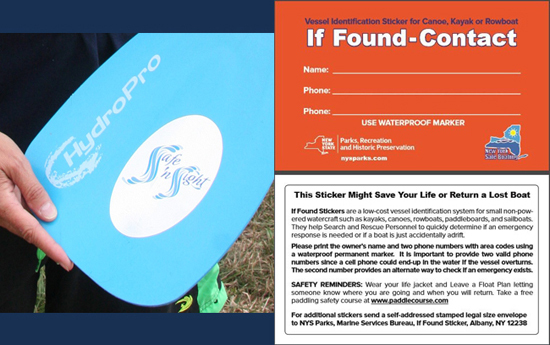 The decals can be requested by sending a self-addressed, stamped envelope to NYS Parks Marine Services Bureau, Safe ‘n Sight Stickers, Albany, NY 12238. A street address is not required. In the water, use the Heat Escape Lessening Position known as HELP. 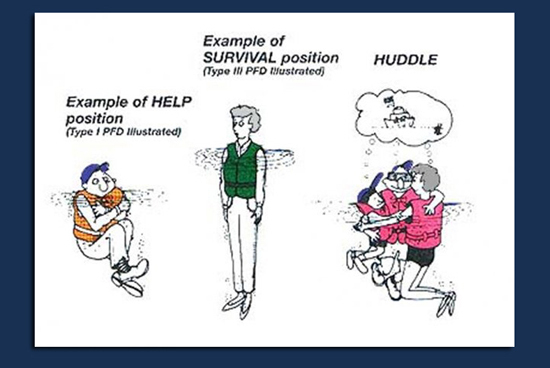 For a Type 1 PFD, the HELP position is crossed ankles, legs drawn together and up to chest, and crossed arms across your chest. For a Type 3 PFD, draw your legs together tightly and keep your arms tight to your sides. Huddle together with a buddy or others in a group. Be aware of water conditions before you launch: are there physical hazards: sandbars, commercial traffic, etc. Know the weather forecast before you go. The Great Lakes Observing System of in-water buoys at glbuoys.glos.us reports periodic real-time wind speed in knots, water temperature in degrees Fahrenheit, and wave height in feet. Swiftly moving weather fronts can cause open water, wind, and wave conditions and temperature to change quickly. The NOAA Great Lakes Observing System Boaters Forecast at data.glos.us/boaters/home can be set up to provide an alert when conditions are likely to change.